The Gyonsi (Hopping Vampire) movies that populated (some might say infested) both the Hong Kong and Taiwan theaters and T.V. screens during the late '80s and early '90s were a subgenre filled with promise, yet ultimately met with disappointment. 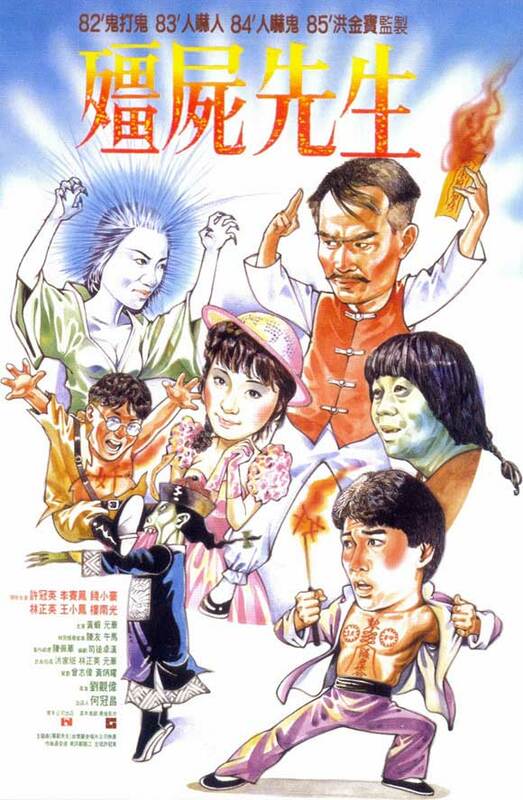 The more of these purely Chinese oddities I watched, the more I found myself having to endure terribly forced, unfunny comedy and worse, the ever present (and ever annoying) child vampire that was there to please the kiddies and provide nice solid family entertainment... yech. Despite the occasional good entry, most of these wound up being something of an endurance test for me. Ironic then that the film that started the craze, 'Mr. Vampire' was a bonafide classic that melded it's clever comedy with genuine scares. It was the 'Abbott and Costello Meet Frankenstein' of Asian horror. The plot; Taoist Priest, Kao (Lam Ching Ying) along with his two bumbling students, Mang Choi (Ricky Hui) and Chau Sang (Chin Siu Hou) is to perform a reburial for a deceased rich man. To their surprise, the corpse still looks fresh and the fear is that it will eventually become a Gyonsi. Despite attempts to keep the corpse where it lay, it manages to break out. It begins a rampage through the countryside. As our heroes attempt to stop it, Mang Choi is bitten and infected with the vampire's blood, slowly begins to turn into a Gyonsi himself. Further complicating matters, Chau Sang has fallen under the spell of a female ghost who is intent on possessing his soul. Kao understandably finds himself in over his head as he attempts to save both of his students while also having to deal with a rampaging hopping vampire. This is one of those instances where everything seemed to just come together. The multiple stories are handled/juggled with precision, the comedy is often very funny (a rarity with these pictures as far as I'm concerned) and the action is of the elite, bone crunching mid-eighties variety (courtesy of action choreographer supreme, Sammo Hung who may have also ghost directed portions of the film). The finale in particular, is one of the most furiously memorable in the genre and one I've revisted countless times. The film could not have been better cast. Lam Ching Ying is a veteran martial arts actor who's perfs date back to the early '70s (he can be seen as an extra in several Bruce Lee films). He lends a strong, authoritative presence to what has turned into his signature role. Chin Siu Hou is known as the action star that almost was. A terrific fighter/actor with enough charisma to have made it, he seemed to stay just on the outside looking in for some reason. Ricky Hui is one of the famed Hui Brothers. Throughout the late 70s and early 80s, he and his brothers Michael and Sam created a series of detective comedies starting with 'Private Eyes' (aka Mr. Boo) that were on the cutting edge of comedy satire at the time. Moon Lee would shortly go on to become one of the top action stars in Hong Kong's 'Girls With Guns/Battling Babes' subgenre. Here she is beautiful, petite funny and extremely charming, showing no hint whatsoever of the whirling dervish warrior that was apparently lurking within. 'Mr. Vampire' is joy to watch. It's combination of creepy, tense horror and genuinely comical comedy was rarely (if ever) matched in Hong Kong cinema of this vintage. It's popularity spawned many sequels (of them, only part three is worthwhile) and imitation/spinoffs. It remains a classic of it's type and the perfect introduction for the uninitiated.